I’ve always known that ceviche is delicious. But the way the fish is supposed to cook in lime juice was was a bit of a phenomenon to me. Making scallop ceviche didn’t necessarily make the process any less magical, but it did confirm how scrumptious – and easy – it is to make. For my recipe, I used red onion, tomatos, cilantro, lots of lime, and mini scallops (because: 1. Sam loves them, and 2. they were a great deal at the market. Sometimes that’s just what it comes down to, folks.) And of course, tortilla chips and avocado for serving. It may be the last week in January, but I just learned that it’s National Soup Month. I must have known it subconsciously, because we’ve pretty much been on a soup diet for the past few weeks. From lentil to minestrone to chili, we’ve made it all. 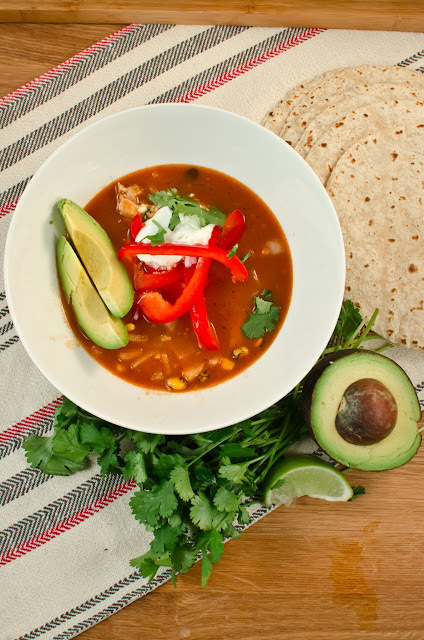 And now I’m happy to add Chicken Tortilla Soup to the list. 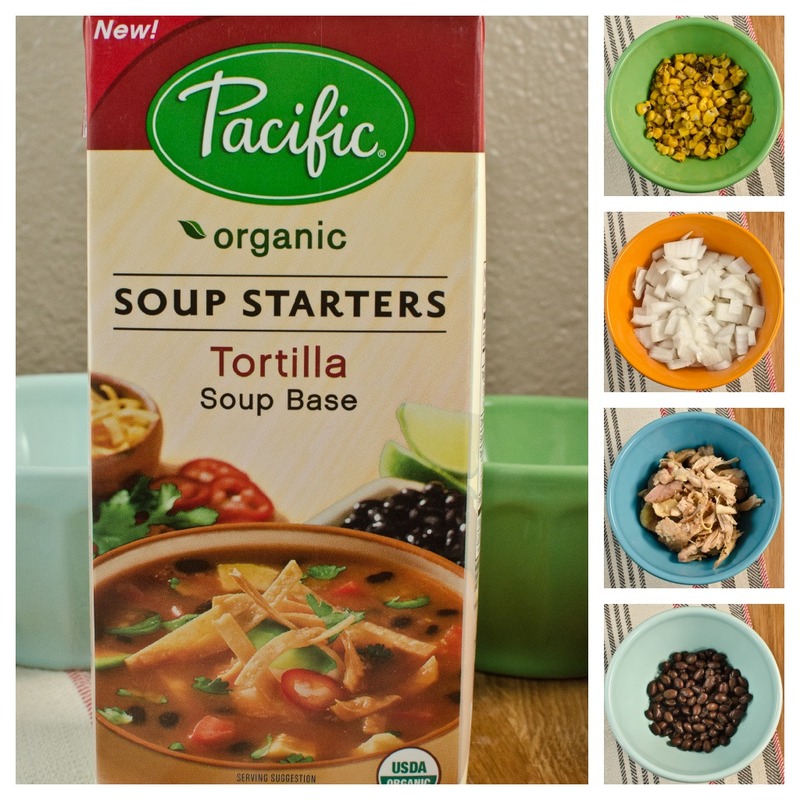 The awesome folks at Pacific Natural Foods recently sent me some samples from their new line of soup starters. I’ve been a loyal Pacific Natural Foods user for years (we always have a box of chicken broth and tomato soup in our cupboard). But these soup starters are going to be our new kitchen staples. I’ve tried three of the starters now (Pho, Tom Yum and Tortilla). They are filled with flavor, and all you need to do is add your fillings, heat and serve. Read my words: the perfect weeknight meal. 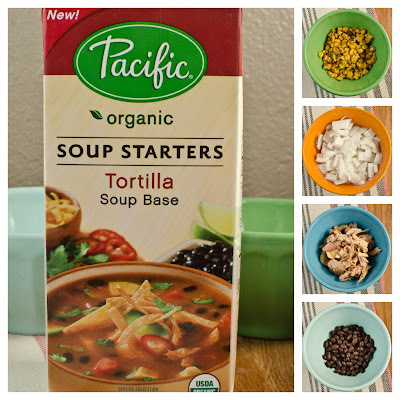 All I did to my version was add black beans, chicken, onions and corn to the starter broth. Once it’s done warming, top with goodies like peppers, sour cream, avocado, cilantro and tortilla chips. Yum. But wait, it gets better. Now YOU can try this soup starter for yourself. Three of you will win a starter kit of your own. It’s SOUPer simple to enter. Um yes, I just went there. Just fill out the form below, and good luck! Entries close at midnight on Friday, February 1. CONTEST OVER. CONGRATS TO OUR WINNERS – JOAN, JODY and EMILY! Saute onions and garlic in olive oil over Medium heat for several minutes until the onions soften. Add chicken, beans, corn, and box of soup starter. Let mixture come to a boil, and let cook for 5 minutes. Serve into bowls. Top with peppers, sour cream, avocado, cilantro and lime. Serve with tortilla chips or corn tortillas. Note: Pacific Natural Foods sent me free soup samples, but I was not compensated for this post. The views are my own. Last week I had margaritas in the rain. Literally. Normally I’d get a kick out of saying this, but the situation felt ridiculous because it was still technically summer. Clearly Portland didn’t get the memo. But – I’ll admit that it was fun to officially record my first true margaritas in the rain experience. Up until this point, the blog has only documented margaritas in the sun. Which, let’s face it, isn’t an accurate account of my life in Portland. After a pretty good soak walk, I joined up with two of my loveliest lady friends on a stormy summer afternoon to try Cha Taqueria & Bar. I had heard that this swanky-looking Mexican joint in NW Portland had a great Happy Hour, and I’d been dying to try it. If you were wondering, Cha is the upscale sister to Portland’s Cha! Cha! Cha! restaurants. 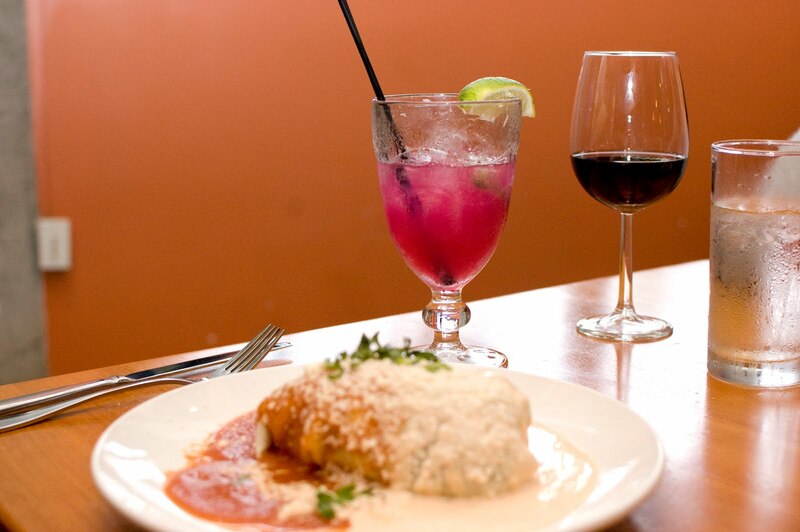 Owner Javier Hurtado was born and raised in Mexico, and has been perfecting “Mexican food for busy Portlanders” for years through these casual restaurants, located throughout the city. 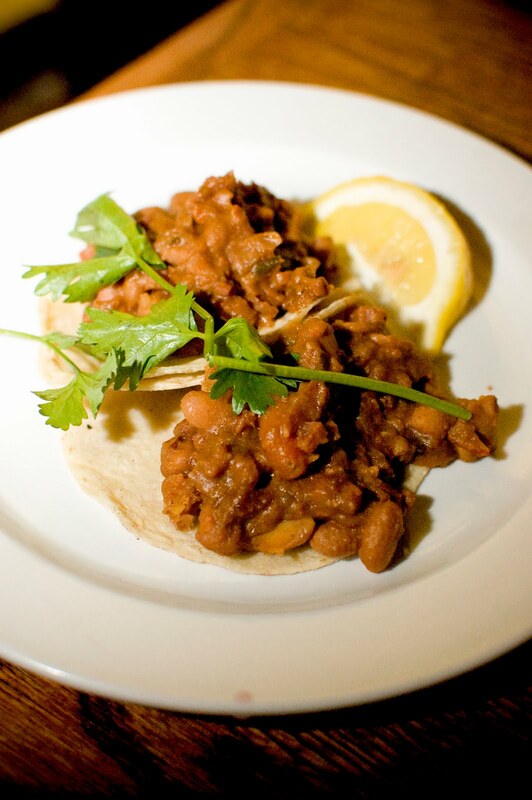 Cha Taqueria, the slightly more formal and authentic eatery, places an emphasis on healthy, organic and sustainable ingredients in a more upscale environment. 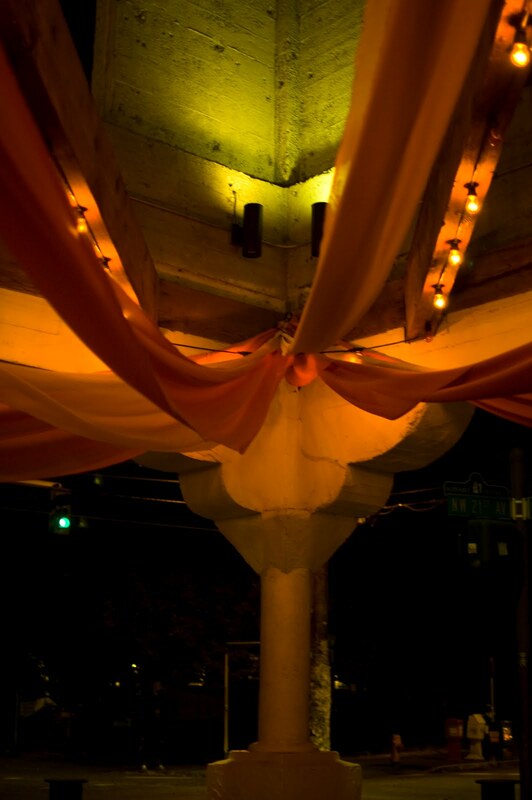 Cha is located on the corner of NW 21st and Hoyt and has a super cute outdoors dining area with plenty of seating for sunnier days. Given the unexpected weather conditions, we opted to sit inside. The interior didn’t disappoint. Bold colors, couch-like seating with cushions and some very cool modern art pieces make for a grand entrance. 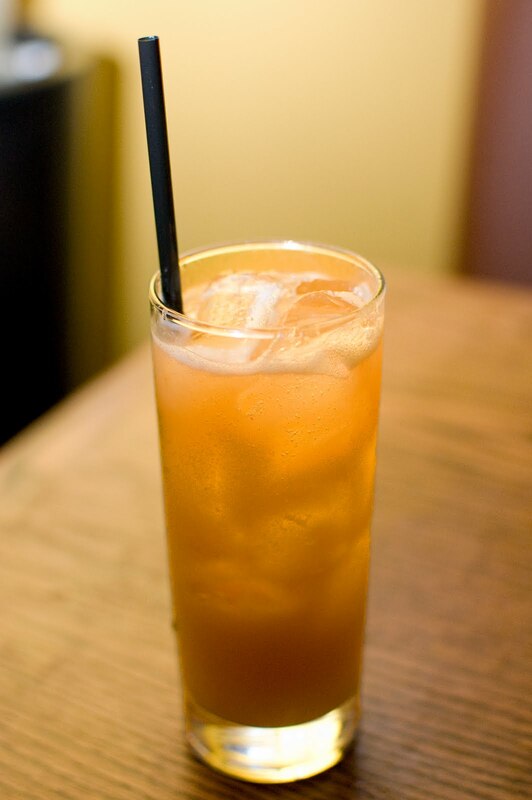 But don’t let this fool you; the attitude at Cha is anything but swanky and frou frou. Instead, it’s inviting and comfortable. 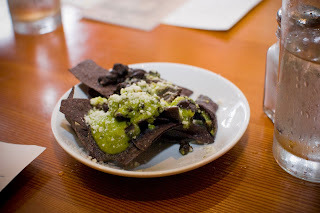 We received a small plate of blue tortilla chips with green salsa and queso fresco to nibble on as we analyzed the Happy Hour menu and filled each other in on the latest and greatest. With 10 items for $5 each that all looked incredible, I ended up asking the waitress for suggestions. 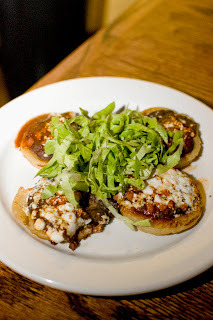 After she described her top picks – ceviche, empanadas and nachos – we ordered the Picaditas, the Santo Burrito and the Nachos for $5 each. Cha’s Happy Hour does feature several drink specials, including their Margarita del Dia (or Margarita of the Day for those of you like me, who embarrassingly asked what this meant) for $5.50. The special of this particular day was Prickly Pear. I decided to be adventurous and order one, knowing that when it comes to flavored margs, I’m normally a guava or mango kind of girl. 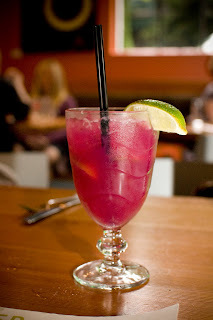 I was surprised to see that when the drinks were served, the Prickly Pair Margarita was bright, bright pink. I actually liked the flavor quite a bit, but I couldn’t get over the color. I figured it had to be something artificial, and inquired about the ingredients from a nice man who made the rounds to check on us several times during our visit (who, I believe is the owner, although thanks to the margarita, I didn’t connect the dots until after I left). So the nice man brought me a carton of prickly pear puree that’s used in the homemade margaritas – proving that the actual purée is truly naturally hot pink! He proceeded to tell me about Cha’s margarita selection, and I learned that they serve many flavors including coconut, passion fruit, guava, mango and others from the same all natural fruit puree. 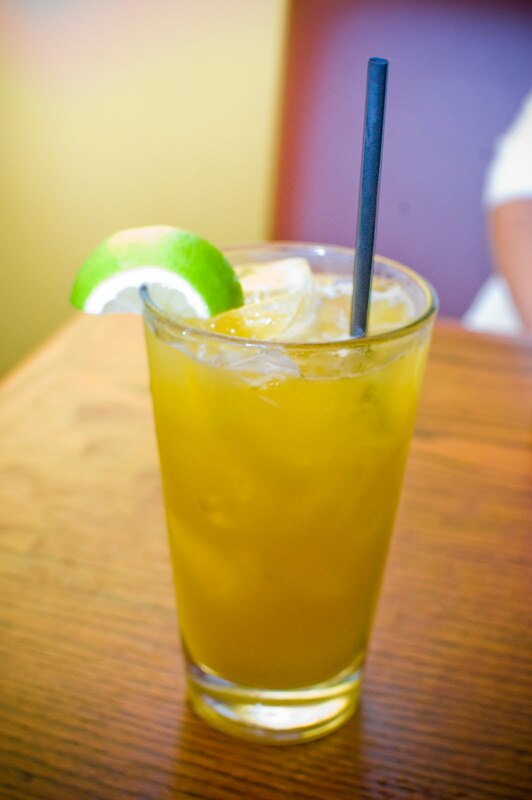 Happy Hour and house margaritas use Sauza Gold tequila. The owner’s favorite, which he recommends, is the jalapeño infused tequila guava margarita. I promised to try it, next time. We were all impressed when the food came. Sometimes you just know something’s going to taste good based on its presentation. 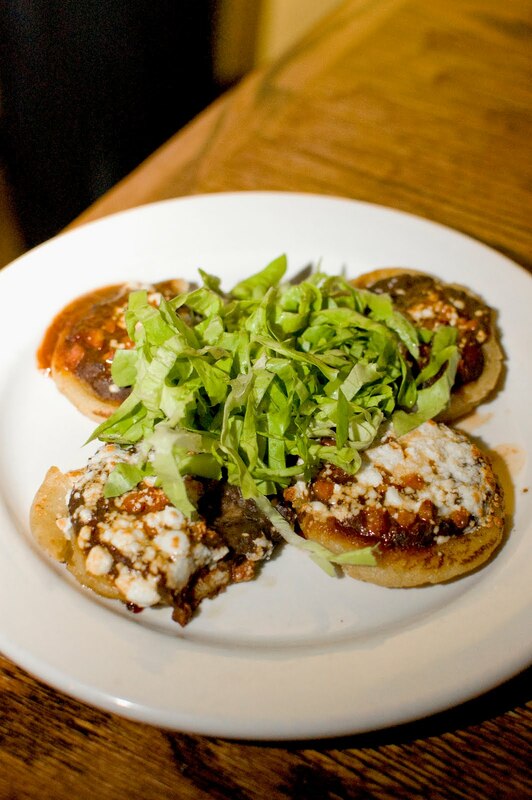 The Picaditas consisted of three corn masa cakes topped with beans, sautéed veggies, queso fresco and avocado. I loved how this dish was literally piled with grilled vegetables – zucchini, broccoli, carrots, peppers and more. 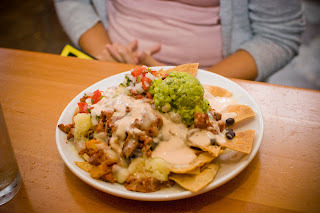 The nachos, a ginormous plate filled with super crunchy corn chips, guacamole, meat, pico de gallo and cheese, were by far the best nachos I’ve had in a while. Somewhere in the process of drinking, tasting, and drinking some more, we coined the nachos as “bomb diggity.” Enough said. And last but not least, the burrito was filled with black beans and rice, some grilled veggies, salsa , chipotle crème and queso fresco. 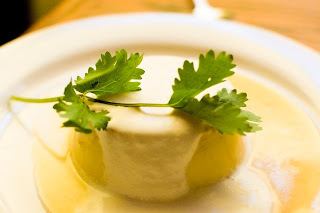 The salsa and chipotle crème gave it a really nice kick – but perhaps what was the most surprising was that it looked like the size of a typical entrée. In fact, all three of the dishes were ordered were impressively sized for Happy Hour, and after sharing the three plates, we were all totally satisfied. Sitting at Cha with my besties, listening to the rain pouring outside, I was reminded of why it’s important to drink margaritas in the rain: it automatically makes a gray day that much more colorful. On Saturday, Sam worked from 1-9 pm and we met up when his shift was over for a late-night happy hour date. Before I reminisce about how incredible our meal was, I do want to mention that I hate that Sam has started working nights to supplement his Grad School income (or lack thereof). I should also mention that Sam and I live together in a one-bedroom, 500 something square foot condo. On the rare occasion we dress up, there’s certainly no “ta da!” element to start the night off. I usually know what shirt he’ll wear because I’ve ironed it; and he knows what dress I’m wearing because he had to excavate it for me from the far top of the closet where I can’t reach. That said, I can’t remember the last time I got dolled up in the condo alone, outfit options thrown all over the bed, singing along to The Weepies playing on full volume. It felt like a real date. 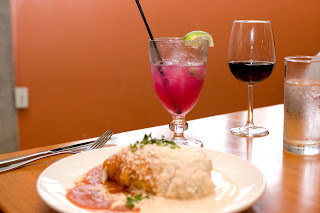 We met at Trebol in NE Portland, which has been on our “must try” list since reading about it in Bon Appetit magazine (who named Trebol as one of the country’s most exciting Mexican restaurants). Trebol’s late night happy hour runs from 9-close, and I was surprised to see that when I arrived at 9:30, the restaurant was fairly quiet for a Saturday night. 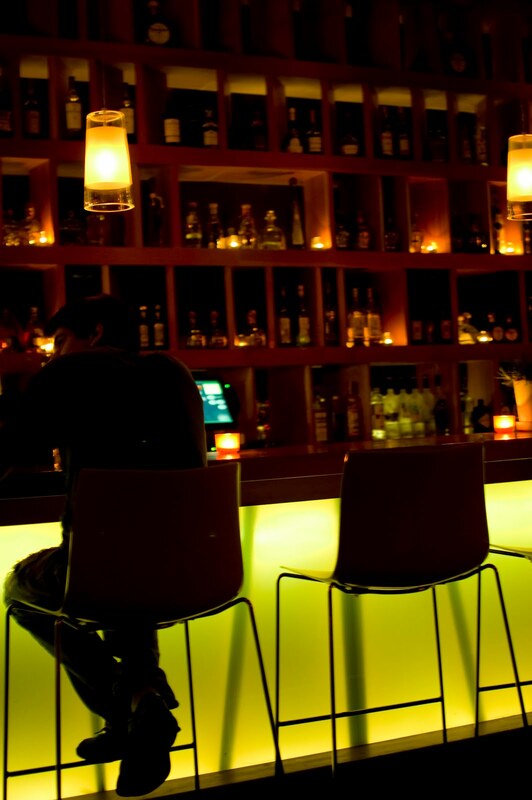 I was seated right away, although I did have to wait for Sam – who had trouble finding the place. You know what they say about men and directions. I noticed right away the sophisticated, hip feel of the restaurant. Red and orange walls, funky lighting, lots of artwork, and many, many bottles of tequila filled Trebol’s interior. Chef Kenny Hill and his wife started Trebol in May, 2007. The restaurant is 100% seasonal and furthermore, incorporates as many organics as possible. Trebol also happens to be the largest tequila provider in town (HELLO! 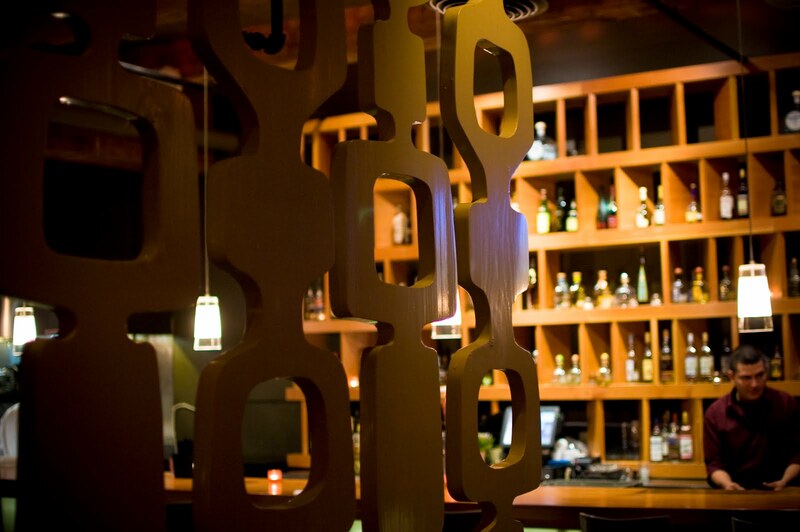 ), with over 95 100% agave tequilas onsite. The dinner menu changes every few weeks, but there are several consistent entries including the tacos. The Happy Hour menu at Trebol is not your typical burger, fries and nachos or humus spread. Think instead: enchiladas, quesadillas, tacos, soup and more. Impressed yet? And to top it all off, the happy hour menu included a variety of margaritas for $6 including Casa, Tamarindo, Prickly Pear, Mango, Blood Orange or Wild Berry. These margaritas are all made with Luna Azul tequila, which is 100% agave (read my words: no hangover!) and absolutely delicious. After talking to the waitress – who was totally kind and patient with us as we asked questions and shot photos – I ordered the Mango Margarita and Sam ordered the Lado Norte ($5), which was made with Gin, fresh lime, white peach and agave. Both drinks were delicious and fresh-tasting. No pre-maid mixers here. I was surprised when our food items came out. They looked minuscule on the plates they were served on. But, man each item really packed a punch and made the items worth ordering. 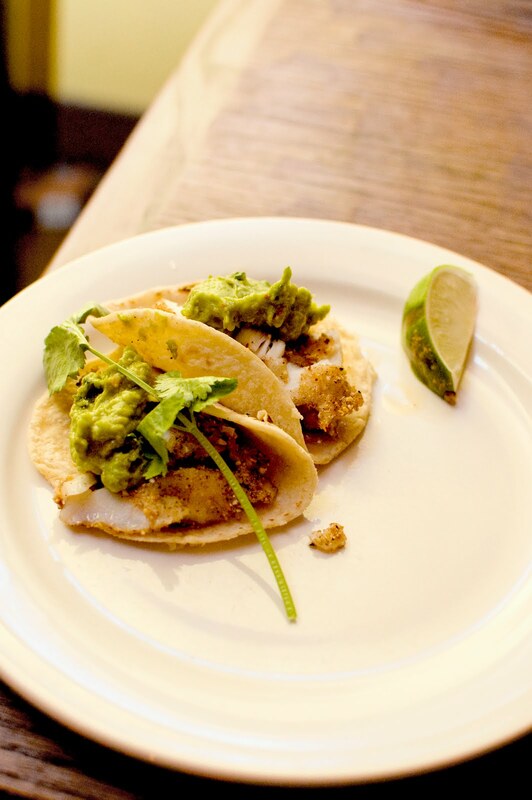 On this particular night, the Fish Tacos were made with halibut covered in crushed Mexican-seasoned pumpkin seeds. As if that wasn’t good enough, they covered the taco in Trebol’s famous guacamole. And it was taaaaasty! Just when we thought life couldn’t get much better, our waitress came by with the dessert menu. I’m slightly frugal by nature and Sam doesn’t have a sweet tooth, so normally we decline ordering dessert. This time though, something caught both of our eyes: the Tequila and Caramel Flan. Flan is, perhaps, Sam’s only dessert downfall. We ordered one to share ($7). The flan was not your typical thick custard; it was light, refreshing, with a hint of citrus – and perhaps even our favorite dish yet.